History of CRISM "Prometey" is intimately connected with history of Russia. Our Institute significantly contributed to national science, industry, defence capacity and in fortunes of a country on the whole. Historically Institute was more than once in the lead of problem solving, was appointed as a leading organization and fully confirmed by its works this status - materials research center of the country. For detailed description of history of our Institute you can see "Virtual museum of CRISM "Prometey" history". Here you can make a tour of our museum, we will show you main exhibits, rare documents and pictures; you will know who built up a reputation of our Institute over decennaries. Institute was found in prewar hard time for our country on the base of Central armor laboratory of Izhora plant in 1939 by Order No. 485 of People's Commissars of Defence Industry dtd. 31.12.1938 and by Order No. 3 of г. № 485 People's Commissars of Shipbuilding Industry dtd. 18.01.1939. Before and during Great Patriotic War all forces of Institute were focused on creation of armored shield of the country. 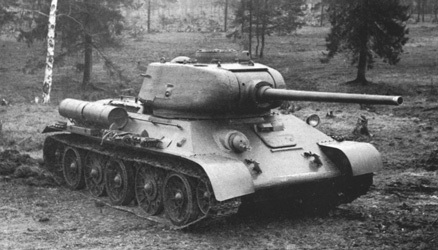 Institute works on development of armour and reliable solid-cast tank turrets for the famous T-34 tank, armour with thickness of 100–500 mm for vertical and horizontal armour protection of battle ships, thin face-hardened armour to protect back of pilot seat for attack and fighter aircrafts contributed significantly to the country defence capacity. During Great Patriotic War, 1941–1945, armour production was mastered at plants of Ural and Siberia. Battle-field teams of Institute specialists work directly in military units. They obtained exceptionally valuable materials on the most affected assemblies and parts of tank turrets and hulls in order to further reinforcement of armour protection as well as develop relevant instructions on firing tactics with enemy tanks precisely specifying the most vulnerable places. 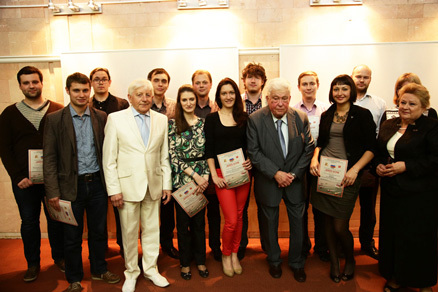 Institute team was awarded Order of Lenin (Decree of the Supreme Soviet of the USSR dtd.16.09.1945) for outstanding works on creation of tank armour as well as works on modernization of armor hulls of tanks and self-propelled artillery plants. New page of Institute development was opened by Decree of the Council of Ministers of the USSR dtd. June 17, 1947 on transfer of TsNII-48 (Institute previous name) to management of Ministry of shipbuilding industry; this event resulted in important works on creation of hull materials and welding methods for navy and commercial shipbuilding. 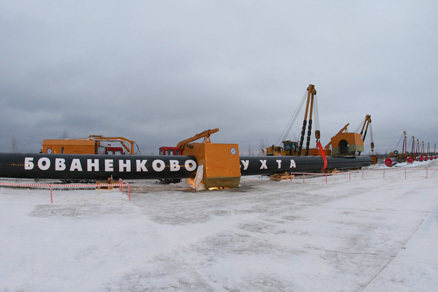 Already in 1953 a pilot batch of the AK-25 steel for the first home-produced nuclear-power submarine, the Leninsky Komsomol, was melt. Not only the exceptionally important task was solved but the scientific basis for creation of new class of materials – high-strength and good weldable hull plates was laid. In the following years the whole series of steels with strength higher than this of the AK-25 steel was developed in the Institute. Their production in form of sheet products, bar section and profiled iron, forgings, castings was mastered in Russian iron and steel works. All home-produced submarines of the I, II and III generations were manufactured from hull plate of this class. Next stages of hull plate development is related to conversion. A series of the AB steels was created; as per their characteristics – cold resistance, weldability, corrosion resistance and other important parameters – this series is considerably superior to the best world specimens. In 1955 with the beginning of development of nuclear power engineering the Institute entrusted with a radically new and critical task – development of structural materials for nuclear power units and plants. A wide range of examinations provided a creation of new class of radiation-resistant and heat-resistant welding steels for nuclear reactor vessels. A wide range of materials ensuring a long service life of nuclear reactors under high pressures, temperatures and neutron irradiation was developed. In the system of Ministry of shipbuilding industry the TsNII-48 became the leading and unique scientific-research institute focusing on research in the field of metal science, metallurgy, casting technology, hot pressure shaping and welding of all structural materials used in naval construction, commercial shipbuilding and production of different-purpose marine facilities. 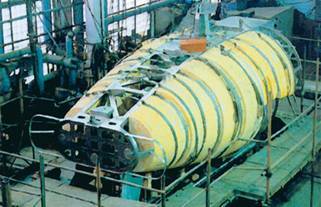 Beginning from the late of 40s Institute performed large-scale works on development of series of cold-resistant, well welded hull plates for surface and undersea fleets. These steels were later used for manufacturing of ship hulls of new generation for civil fleet (light carriers, icebreakers, tankers, gas carrier vessels), offshore floating self-elevating and semi-submersible drilling rigs such as Shelf type, unique ice-resistant fixed platforms. In the middle of 50s due to need for construction of fundamentally new ships – hydrofoil and air-cushion ships – Institute was entrusted with a task of creation of marine grade corrosion-resistant welding aluminium alloys. 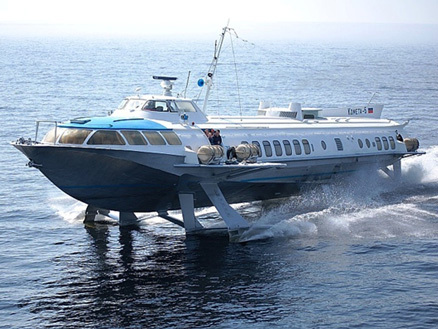 The whole navy high-speed hydrofoil and air-cushion ships as well as civil hydrofoil ships such as Strela, Kolkhida, Kometa, Vikhr, Tayfun and river ships such as Raketa, Belarus, Sputnik, Voskhod were built from marine grade alloys developed by the Institute. Ships made from aluminium alloys developed by the Institute are successfully operated for more than 50 years including in foreign countries – Greece, Britain etc. For the first time worldwide the Institute initiated use of titanium alloys in naval architecture as materials having unique properties – high strength, corrosion resistance in sea water and non-magnetization. In 1956 by Order of Ship-Building Industry Minister, E.B. Butoma, a new scientific field – development of titanium alloys enabled to be operated under marine conditions, was formed in the Institute on a basis of studies performed since 1953. To found solution the Institute needed for the first time in world practice to solve problem of organization of specialized titanium production to manufacture large-sized sheets, castings, forgings from high-strength corrosion-resistant titanium alloys. This task was successfully solved that allowed in 80s to obtain the maximum production level of these alloys – 105 000 – 110 000 ton per year while worldwide the total production level of titanium alloys achieved only 80 000 ton per year. A series of Navy submarine ships and unmanned deep-sea vehicles were built from high-strength welding titanium alloyed developed by the Institute. High-technology well welded marine grade titanium alloys of different strength level and technology of their manufacturing were developed, their industrial production was organized and a wide nomenclature of semi-finished products was created. For the first time in global practice for titanium alloys it succeeded to develop welding technology for sheets of great thickness and length. As a result the first in the world one-piece titanium submarine distinguished by record underwater speed was built. In 1981 Institute was awarded Order of the Red Banner of Labour for significant contribution to creation of new special facilities. In 1986 By Order of Ship-Building Industry Minister the Institute was given work on creation and implementation of non-metallic materials including anti-corrosion and anti-fouling materials for ships, creation of polymer-based composite materials, ceramics, glass-reinforced plastics, coatings, adhesives and paints related to shipbuilding industry. 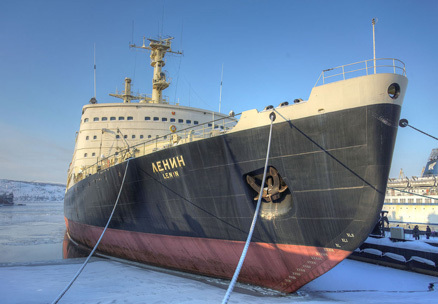 In this field Institute developed new hybrid materials the composition of which combines reinforcing components of different chemical nature increasing performance of ship hull and significantly reducing its weight. 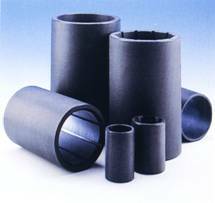 Vibration-absorptive materials were developed and widely used. Range of non-metallic materials is very large. Use of carbon fiber-reinforced plastics for friction bearings capable to operate with water lubricant, corrosive liquid lubricant or without lubricant at all is very important. At that wear resistance, strength, dimensional stability and ecological cleanness are provided. 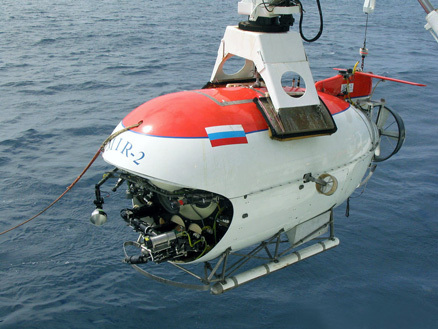 Works on development of new generation of spherical plastics used in underwater structures and hydraulic jets of ships are in progress. High-strength syntactic foams obtained a wide circulation in building of deep-water facilities. corrosion and erosion resistance and wear resistance. At the present time FSUE CRISM "Prometey" is the largest materials research center in the country, key strategic company and meet the overarching challenges of scientific and technical development, national safety and national defence capability. Institute has a status of State Research Center of Russian Federation (Government Regulation of Russian Federation No.649 dtd. 05.06.1994 and Government Decree of Russian Federation No. 797-r dtd.15.05.2013 г.) in entered. into Consolidated Register of defence contractors (Decree of the Ministry of Industry and Energy of Russian Federation No. 774 dtd. 21.08.2009, No. 137 dtd. 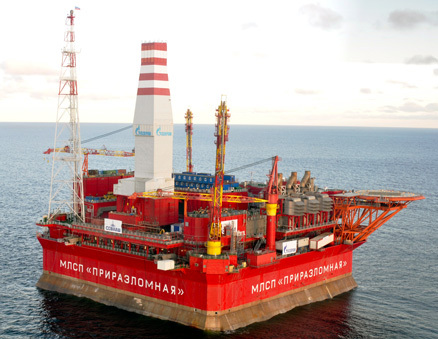 05.02.2013, Decree of the Ministry of Industry and Energy of Russian Federation No.1703 dtd. 23.10.2013 On the Approval of the List of Companies Entered into Consolidated Register of Defence Contractors). 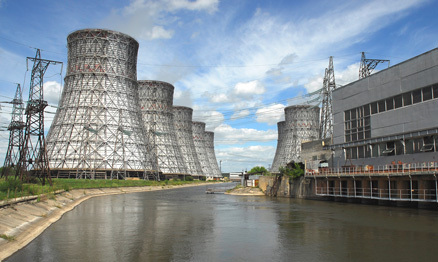 energy efficiency, energy saving, nuclear power engineering. leading materials research center of development of materials and technologies for commercial shipbuilding, naval construction and building of marine facilities. Inauguration of science and technology sector of development of structural nanomaterials (Nanocenter) in FSUE CRISM "Prometey"
FSUE CRISM "Prometey" is classified as organization of the first category – scientific organization – leader. Today Institute performs broad-scale research and developments the results of which will define scientific and technical progress of different branches of home industry. This is a creation of new generation of cold-resistant lean alloyed well-weldable steel (arc index); development of improved heat-resistant and radiation-resistant low-active steels; nonmagnetic high-strength corrosion-resistant nitrogen-bearing steels; manufacturing technologies of large-sized castings and application of low-active corrosion-resistant coatings on pressure vessels; development of industrial engineering of materials from high-strength welding titanium alloys for marine facilities; development of manufacturing technologies of new generation of polymer composites and many other developments. Only over the last three years about one hundred advanced manufacturing technologies were created and used by the Institute. Scientific work of FSUE CRISM "Prometey" is intimately connected with St. Petersburg living. Institute took an active part in development of city energy industry, reconstruction of its architectural look and historic preservation. The most striking instances – post-war reconstruction of the Alexander Nevski Monastery, restoration Peter the First monuments (The Bronze Horseman) and monument in front of Mikhailovsky castle, Nickolay the First monument in the St. Isaac square, grid of the Summer Garden, domes of the Church of the Spilled Blood, construction of armillary sphere on the Kunstkamera building, development of wear-resistant coatings and waterproofing compound for more than twenty bridge structures etc. 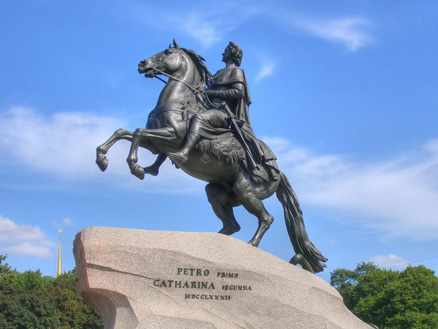 The Bronze Horseman (Peter the First monument) is one of St. Petersburg symbol renovated with participation of FSUE CRISM "Prometey"
New classes of structural materials developed by the Institute and principally nitrogen-bearing steels, nanomaterials, intermetallic compounds, multipurpose coatings and composite materials allow Russian industry to produce fundamentally new and high-efficiency samples of the state-of-the-art technology. 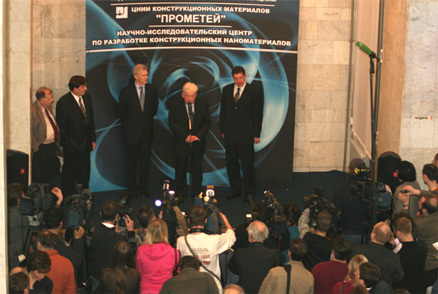 Over a number of years FSUE CRISM "Prometey" performs scientific and research, research and technology works according to Federal Target Programs: Research and development to priority directions of Russian science and technology sector development for 2007–2020, academic and teaching staff, Nanoindustry infrastructure development in Russian Federation, National processing base, Development of civil marine facilities, FTsP-1, FTsP-2. High scientific level of research and research intensity of industrial and technological developments of FSUE CRISM "Prometey" are defined by high qualification of its specialists. Institute staff is a highly skilled scientific and engineering personnel including 5 members and corresponding members of different International academies, 6 members and corresponding members of civic academies, 20 doctors of sciences, 114 candidate of science, 40 specialists have honorary titles Scientific personnel is trained to three scientific specialties, there is a postgraduate centre with two Dissertation Councils, three schools of sciences recognized in the country and abroad. Institute has basic subdepartments at two universities. Thanks to influx of young specialists over the last years the human and scientific engineering potential of the Institute is increased. 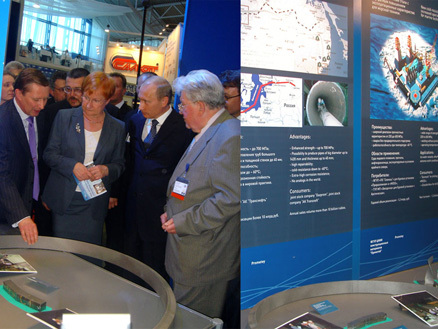 FSUE CRISM "Prometey" collaborates with leading institutes of Academies of Sciences, scientific centers and scientific management of different industry branches, leading design bureaus and production plants of Russian Federation, preserves and develops scientific and technological cooperation with many material research organizations of Europe and Asia. 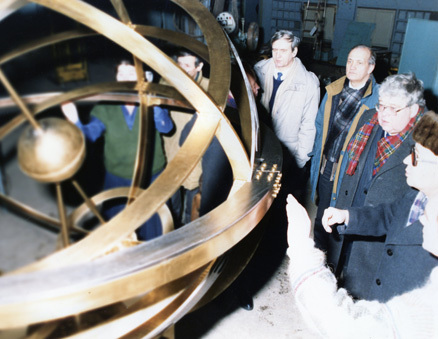 Keeping continuity of schools of sciences and strengthening of leading position of Russia in material science – field of knowledge where positions of our country are traditionally strong – is one of the most important task of the Institute.